I love fabrics, I really do. Do you enjoy touching all of the fabrics when you go shopping? I like to feel their texture, I like to see the prints, the woven patterns, and the solid colors. I notice the way the silk shimmers, and the way linen drapes on the floor. Each fiber has a special uniqueness to it. 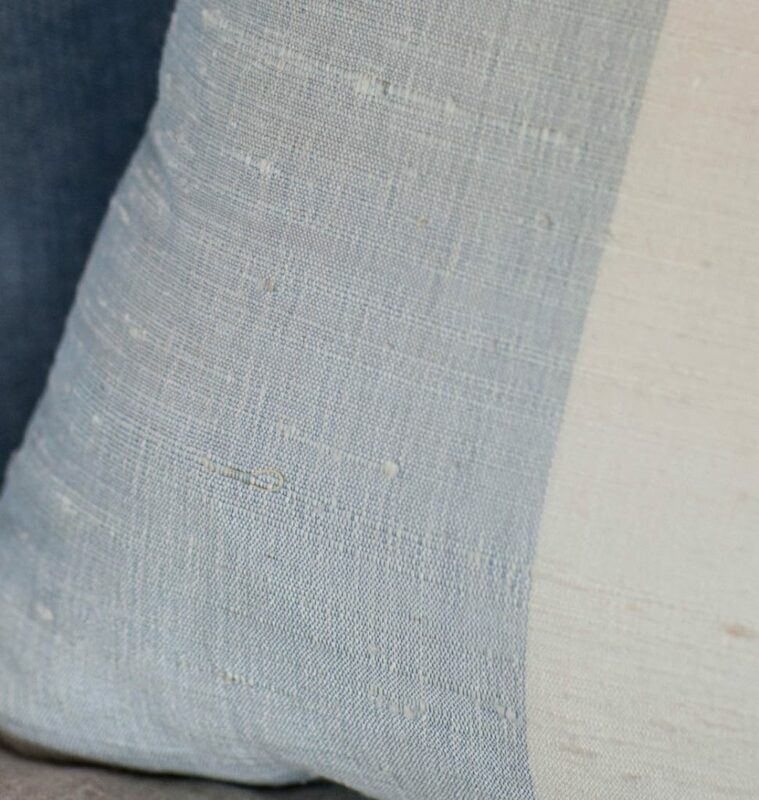 Today I’m talking about this silk blue striped pillow. I have talked about linen, but I haven’t focused much on silk. Silk is a delicate fabric, and I wouldn’t use it for just any project. But for a special spot, where it won’t get heavy wear, it’s perfect. I would love to see this fabric in curtains as a matter of fact. If you do make curtains in this fabric, please, please send me a photo. I know it will be stunning. And for anyone using this fabric for curtains, please make sure to line the curtains. Silk is delicate and can break down over time if you don’t protect it from the sun. Even though silk is a delicate fabric, I don’t think we should overlook it’s beauty and value. Silk has an elegance to it, that is difficult to replicate in other fabrics. This fabric is called Elegant in color sky, find it HERE. The fabric is so soft to the touch, and has a shimmer in the light. I feel like I say this all of the time, but it’s true. This is one of my very favorite pillows. I did a reverse pattern on the back of the pillow, so one side has the blue stripe in the center and the back has the white stripe in the center. The fabric is very soft, but has a slightly nubby texture. I love all of the beautiful texture. The blue is a soft color. 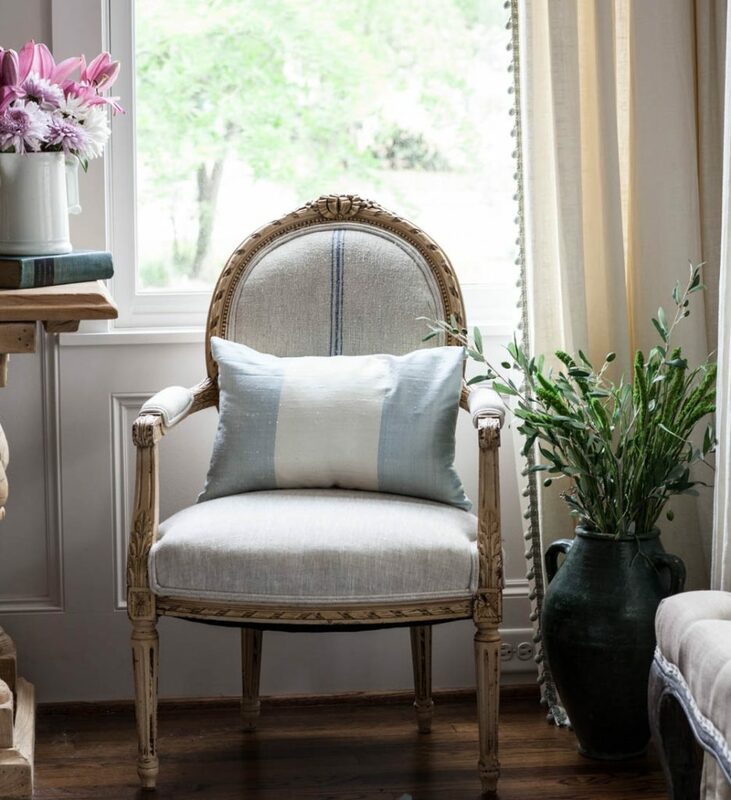 I love the way the elegant silk pillow works so well with my French chair redone in simple grain sack fabric. Note the blues don’t match, but that’s okay. The chair, an antique, is wearing it’s original paint. Today’s podcast episode is all about kitchen islands. The giveaway is going on for the remainder of April. Even if you entered on the previous Calico post CLICK HERE, you can still enter again on this post. CLICK HERE to visit Calico. Select your favorite fabric, then come back here and leave a comment telling me which one you like. 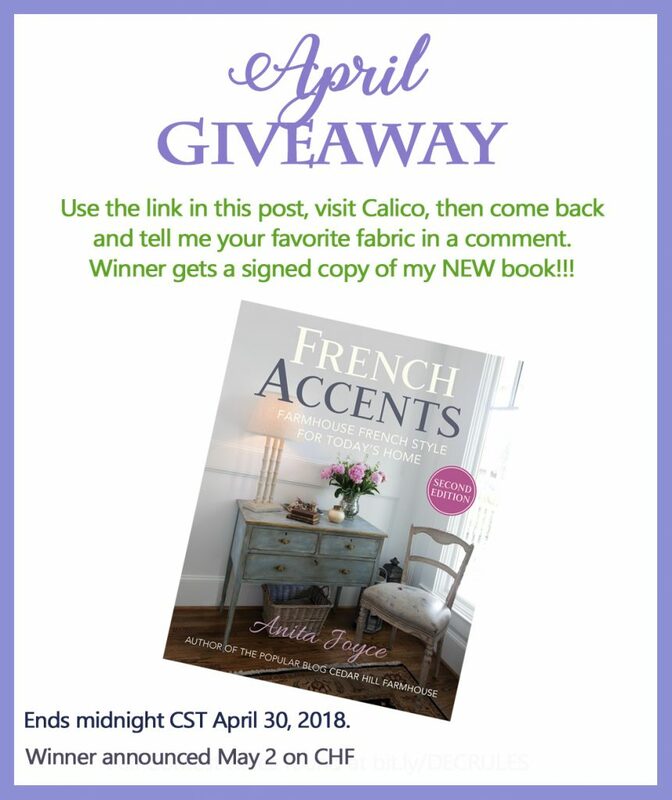 One comment (entry) per Calico giveaway post in April. Must be over 18, and in the 48 contiguous states. Void where prohibited by law. Hi Anita, I went to Calico and I love the Elegant in Sky pillow. It would match my living room also. I don’t usually win anything but would love to win this pillow! I wish everyone could win Rosemarie! I love the Tico Mist pattern! What a great giveaway, pillows are an excellent way to refresh a room. I like Oxnard navy by Vern Yip. It would make a great pillow. I chose Mondera by Vern Yip. I love he colors of Anastasia Garden- so cheerful! You don’t have to be a sewer Ann. You are so adorable! I like the Laurent Indigo or the Cabrile. Love pillows! I chose the fabric in Cabrera Fiesta. This is a great giveaway. Cotswold Mist – such an adorable French country fabric! Loving that elegant but in the color blossom. Have been needing some pillows for my bed and chair and this would be beautiful. Anita, the pillow is just gorgeous! The color, the pattern and of course the way it looks on your beautiful chair!! Love it! I love the anastasia garden! I’m thinking the Riva Peacock would go nicely on my back porch chairs. I love the Bubble Tea by Candace Olson! I love fabric & design, too! I narrowed it to a couple of favorites, Ashfield Faille Floral-Carbon by Ralph Lauren & the “New” Calista Granite… paired w/ Plaid Affair- Onyx by Robert Allen or checked pattern. 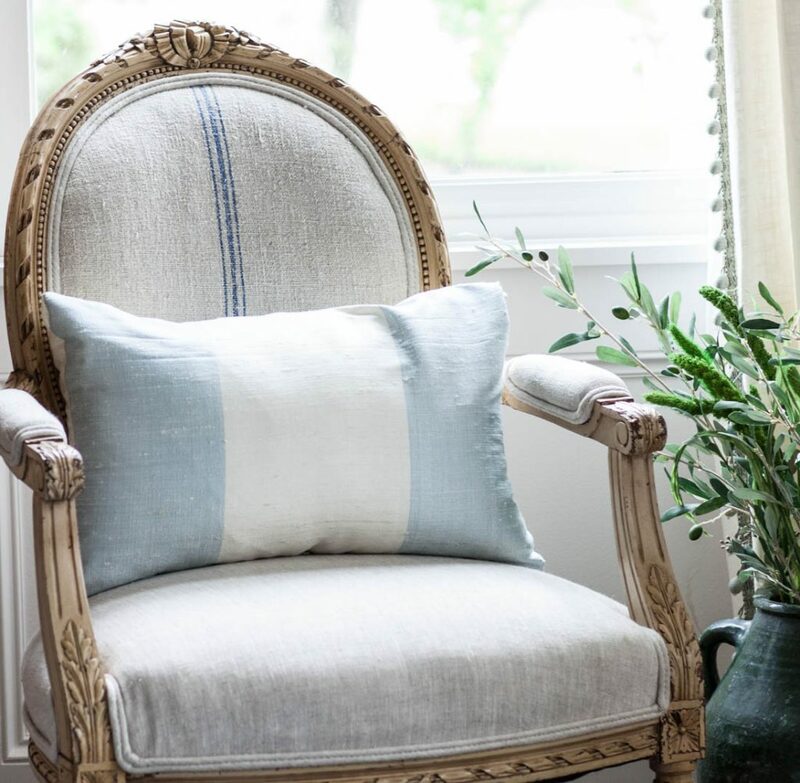 Love the blue stripe pillow! I’m getting a Brother sewing machine so I can ” relearn” my sewing skills from decades ago! I’m looking forward to making pillows for my new apartment. I chose the Robert Allen – Austin ” Spa” fabric. I love the coastal feel that many of his fabrics have. This is a beautiful line that I will have to remember… 😉 Thank – you for this opportunity!! I really love Koss – Jaclyn Smith – Navy. As well as many others!! I am a fabric lover as well, I can’t resist touching and imagining the many fabrics in my home. LOVE the Kaffa Flora Bk Indigo. I love the Stitched Block Robert Allen Fabric in Capri! Thanks for the chance to win Anita! I love Lynette La Mer! So soft and pretty💗thank you for a chance to win your book! Abstract in mineral garden is beautiful! Gasp, Anita I love your Elegant Sky pillow but Elegant Blossom would work better with my decor! You have such beautiful tastel Love the pillow on your chair. I didn’t have to go far to fins a sample Iliked a lot. I picked Ikat Reflect Leaf. The muted pattern speaks to me. I wanted to reach out and touch them all. Love Aimee Silver but far but since I live outside the US I probaly won’t win your giveaway. Oh I am sorry Anja. I am with you Anita, I LOVE they Elegant in sky. Just gorgeous. I just bought a new home and I am trying to pull off the french country look but I a not a great decorator. I bought your book and it is a great help. Thank you! Oh Denise. I am sure you are just being modest! Share pictures when you can!! Love your pillow! I also like Florence Linen Damask – Ralph Lauren – Mist fabric. As everyone else, I would love to win. And with that, I would probable redo my entire guestroom. Oh, how to choose?!! TiVo Mist for my curtains. Now I just need someone to sew for me! I used to sew all the time-30 years ago. Maybe I should buy a sewing machine again. Thank you! Gosh! I meant Tico Mist! Looking at all those swatches reminded me of the many trips to the fabric store with my mom. She too would rub her hands along the fabric as I grew bored waiting for her to decide. She loved them all it seemed! Well now I get it! Ha!!!! So if I have to pick one – Thomas Porcelain is quite elegant looking. First, I love the look of your updated mountain living room! It is beautiful. I would like to win that beautiful silk sky pillow! I am a pillow enthusiast; using these items can make all the difference in changing the look of a room without investing a lot of money to do so. Blues and creams are always a go-to for my decor. Sapphire being my birthstone…it seems fitting that I would like this one. Elegant in the color sky is my very favorite if all! Love Lynnette La Mer. Would go well in my French country style home. It’s funny I love the -ditchley-park-madcap-cottage-rhubarb, I don’t even have this color anywhere in my house. I have to chime in also because I would love to get the new addition of your book. I have the first one and love it. I like Heather Lane, would love a chair covered in this. I love lots of the fabrics but Brando Velvet by Robert Allen seems to call to me. Thank you for the giveaway. I love reading your posts. WOW so many beautiful fabrics. I love the Blomstrategy Robert Allen Fabrice Dew! I also would love your book! Please enter me into the drawing. My favorite fabric is Floret by Vern Yip in Turquoise CLoud. Thank you !! 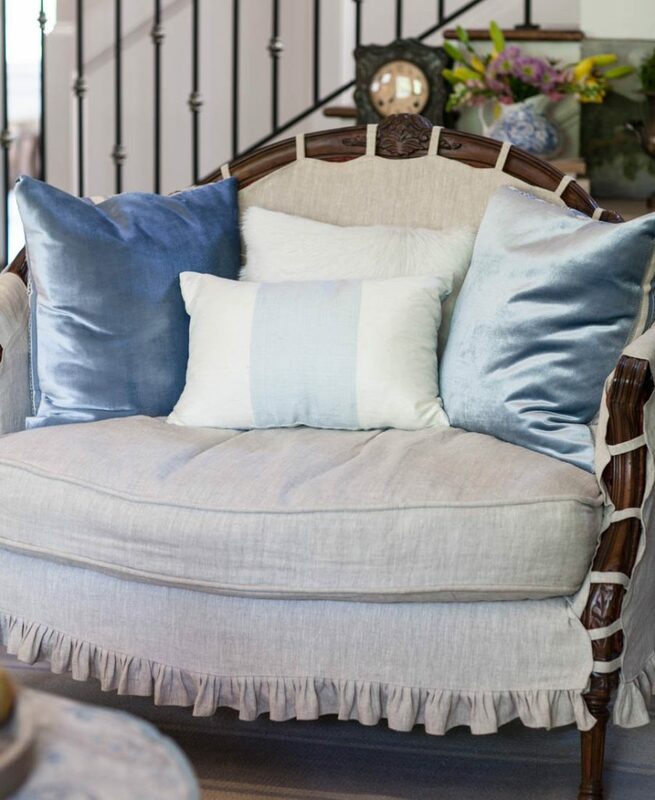 I know the giveaway for the pillow is over, but can we talk about that gorgeous french armchair? French Country striped seating has always held a special charm. It is casual and sophisticated all in one and this chair captivates that feeling. What a great little quiet space. Love it! Thank you for posting.